As a good friend said while writing me birthday wishes today, I’m a lucky duck. We landed in Kauai last night so I was able to spend my birthday touring the island’s eastern and northern areas. It was a great day in the forests, on the beach and in the water with my family. I started the day making abstract images of wet leaves with my son and finished the day photographing in the Taro (Kalo) fields in the Hanalei Valley with my dad – both very special moments. A wonderful day for a fortunate web-footed broad-billed bird like me. Thank you for all of the very kind messages and warm wishes. This entry was posted on December 15, 2011 by Christopher Martin. 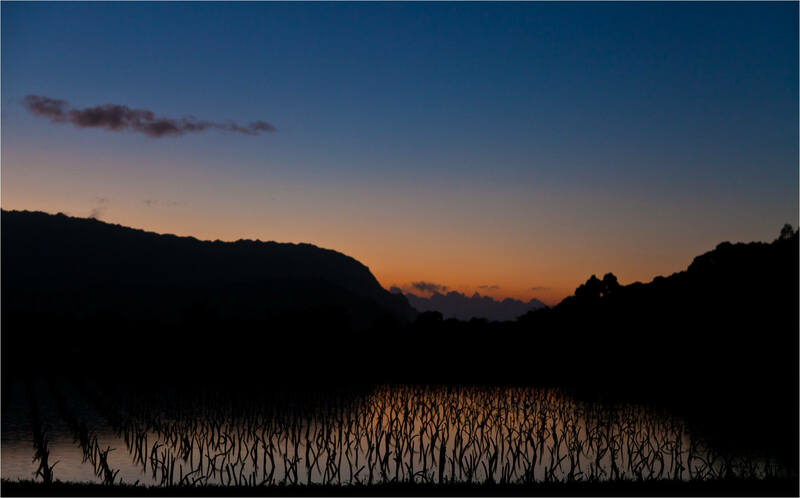 It was filed under Hawaii, Landscapes, Travel and was tagged with Hanalei, Hawaii, Kauai, landscape photography, silhouette, sunset. Really like the plants (taro?) in the water in this sunset shot – makes it much more interesting that just water and sky on it’s own (like the usual sunset images).